Hydrangeas are the 5th most important export flower of Colombia in terms of value and the 2nd in terms of production area. Both, volume and value are still increasing. 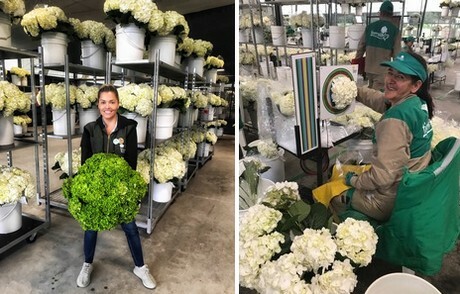 The United States is still by far the most important export market for these flowers, but volumes to China, Russia, France, Malaysia, Qatar have shown an exponential growth. Colombian export association Asocolflores summarized the 2017 export figures of Colombian hydrangeas and compared it with those of 2016. 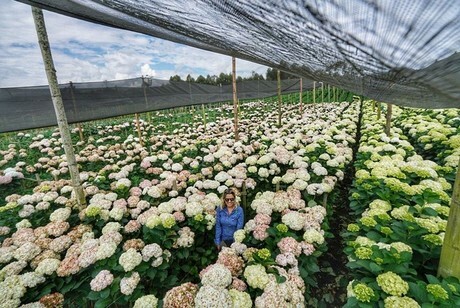 Catalina Arango, Commercial Director at Flores Del Este, one of Colombia’s largest hydrangea growers explains the trends. 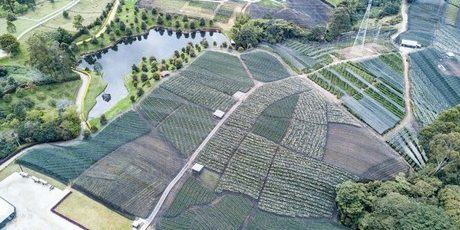 After the rose, the carnation, chrysanthemum and alstroemeria, the hydrangea is the most important flower crop of Colombia in terms of value and in terms of production area it is the most important crop (1,250ha) after roses (2,580 ha). In 2016, 17,566 tons of hydrangeas with a total value of over 72.5 million USD left the country. From January till September 13,304 tons of flowers, worth almost 56 million USD, left the country in 2016, and 14,453 tons of flowers, worth almost 58 million, in 2017. This is a 3.4 percent increase in value and a 8.6 percent increase in volume. According Arango, there are several reasons for this increase of production volume. A second reason for the increase in production volume is the growing popularity for hydrangeas. “Due to the large size of the flowers and the variety of colors available, the popularity of hydrangeas continues to grow. They are frequently used in bouquets and large arrangements. You often see them in flower decorations for weddings, parties and events”, she says. Production location Flores Del Este. Other interesting trends to notice from the export figures of Asocolflores is the exponential growth in export numbers to China, Russia, France, Malaysia and Qatar. Comparing the months from January till September of 2016 with these months in 2017, Colombia exported over 100 percent more hydrangeas to these countries. Post harvest area Flores Del Este. China has been a growing market for Flores Del Este too. “China is changing: over 15 million people are getting out of poverty and joining the middle class every year. 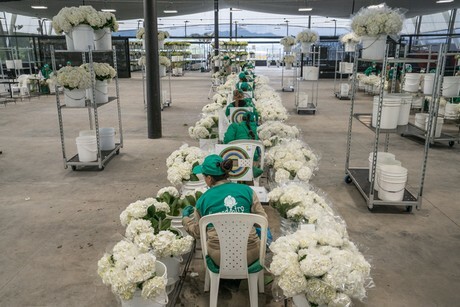 this equals to higher purchasing power and also because of the westernization of consumption trends (oriented to luxury), this means it opens the doors for the Colombian flowers in market niches such as hotels and weddings”, explains Arango. Over the years, more growers started to grow hydrangeas in the country. The top five hydrangea exporters are Guamito SAS, Flores Del Este, C.I. San Francisco Gardens, Comercializadora Internacional Zion Flowers Sociedad Por Acc and FlorAndina. These five companies are responsible for over 17 percent of the total value of hydrangeas in USD (almost 58 million) that has been exported in 2017 (between January and September).